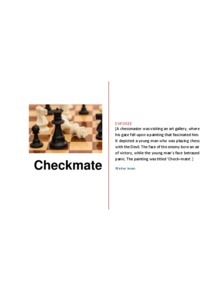 Original title in German: "Schachmatt"
As the chessmaster was looking closely at the picture, something both­ered him. Something was not quite right about the painting. He sought out the curator of the gallery, and asked him to take the picture down. When the curator declined, he asked for a meeting with the artist, who was willing and made an appointment to meet the chessmaster in the gallery.